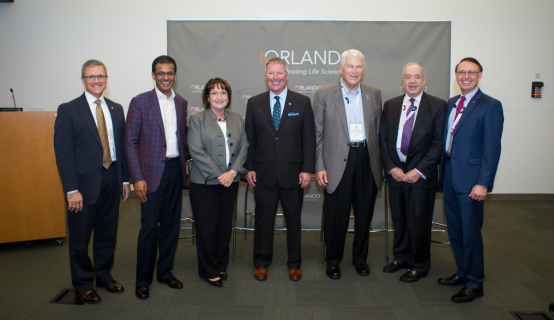 Orange County Mayor Teresa Jacobs recently joined community leaders at Lake Nona’s Sanford-Burnham Medical Research Institute to announce the launch of IQ Orlando, an innovative partnership to grow Central Florida’s life science cluster to improve community health. The partnership between The University of Central Florida, Tavistock Group, AHG Group and Florida Hospital will focus on recruiting and launching health-focused start-ups to the region. The goals of IQ Orlando include improving the health of the population, increasing access to care and lowering the cost of health care. The collective strength of IQ Orlando will serve as an ecosystem to grow early and mid-stage life science companies. As a way to bring their unique resources together, IQ Orlando introduced the Orlando Digital Health Lab (ODHL) to address high priority healthcare issues, including the cost of care and better outcomes. Digital Health applies technology to the life sciences and helps patients become active health partners. ODHL will also provide start-ups with a platform to develop and test new enterprise and consumer applications at the new Gate Way Center at Medical City. The Gate Way Center location will be the hub of a growing network of resources that will be a magnet platform that draws companies to Central Florida from all over the globe. “What will distinguish IQ Orlando is the benefit of having a living laboratory so innovators can develop their solutions in concert with end-users,” said Rasesh Thakkar, senior managing director of Tavistock Group, developer of Lake Nona, an award-winning, health-inspired community that is anchored by Lake Nona’s Medical City, one of the nation’s fastest growing life sciences innovation clusters. The IQ Orlando announcement was part of the 2015 Lake Nona Impact Forum, a gathering of 250 of the nation’s top health care CEOs and thought leaders to inspire health innovations. A collection of photos from the launch of IQ Orlando are available for use by the media and are located on Flickr.